In the mid 1970s, Bill Chatlos and his wife, Janet, had a tough time getting information about the retinitis pigmentosa that was stealing Bill’s vision. Doctors knew very little about the condition, and researching the Internet wouldn’t become a reality for another 20 years. Bill says that ophthalmologic text books at the library had only a page or two describing RP. One of Bill’s pivotal accomplishments with FFB was his work in establishing the William F. Chatlos Professorship of Ophthalmology, which enabled Dr. Eliot Berson’s tenure as a professor of ophthalmology at Harvard University Medical School. “We were blown away by Dr. Berson’s abilities,” recalls Bill. “At the time, in 1978, he was a young, up-and-coming physician and faculty member with impressive credentials and numerous awards.” For decades since, Dr. Berson has been regarded as one of the world’s top retinal physicians and researchers. 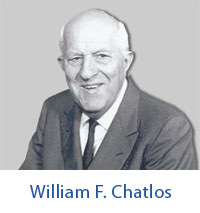 The professorship was actually named after Bill’s grandfather, William Frederick Chatlos, who first established The Chatlos Foundation, and was a great mentor and inspiration to his grandson. Bill describes his grandfather as a stoic, self-made man who achieved noteworthy success in real estate development. 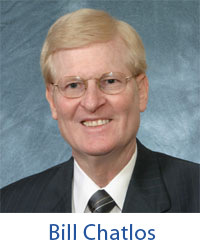 Bill says, “As a young boy, he earned money for his family by carrying lumber between construction sites. He eventually earned enough to buy a wheel barrel, and later, an old truck. By the time he was 16, he had built his first house from the ground up, and had a crew working for him. He took drafting classes at the YMCA to learn how to draw architectural plans.” During the Depression, William acquired real estate and stock at pennies on the dollar — a strategy that later yielded excellent returns. After college, Bill joined Sears, Roebuck and Co., serving in managerial roles in a variety of locales, but eventually settled in Central Florida where he went into commercial real estate development. He and Janet have been married for 39 years and have four adult children and three grandchildren. Only one other member of his family, a great nephew, has developed RP. If you would like to learn more about the work of the Foundation Fighting Blindness for yourself or a loved one visit: http://www.blindness.org/.